5 + 4 = ? : (Required) Please type in the correct answer to the math question. 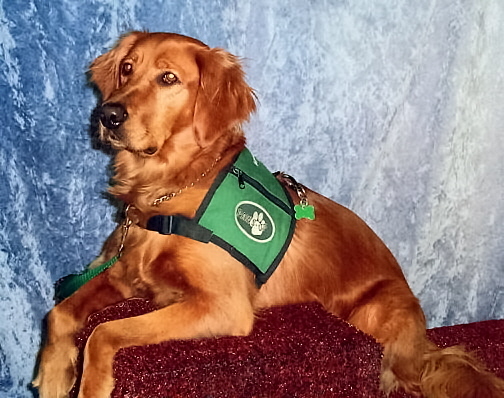 It is with great sadness to tell you of the passing of my service dog "Hailey". She was 13 years old and had been with me for 11 years. What a joy she was and what great healing she brought to me. After all the Doctors, nurses, psychiatrist's, medicine, and therapist's, I was told that I could and would receive a service dog. For the first time I had hope, hope that I might get well. When I first saw her, I knew that she was going to lead me out of the darkness and into recovery. Her trainers from Wichita came to Abilene for a weekend of intense training and testing. There she stood, regal, red and brand new. I could tell from the look in her eye that she took her job seriously and I could now feel safe. We had some challenges in the beginning but made our way through and became a team. She was never away from me, if I moved she moved. I was proud to stand beside her and she was proud to be with me. Six years ago she took on a new job. Train the new guy, Sammy, show him just how this job is done. After a year of Sammy shadowing Hailey she was ready to retire. She enjoyed her couch, walks, frogs, toys and eating. She would watch Sammy work making sure that all was well. A week before she died, I was alone in the house, Sammy was outside and Mike was gone. I had an incident that left me on the floor in the hall. I called to her and she made her way to me with great effort and got me up and lead me to the couch. Blind deaf and crippled she would still work. When you are out and see a service dog team, take a minute and know that a dog just like that help your friend live a better life. A special thanks the Susan, Dr. Scott, and all the staff at Abilene Animal Hospital for taking such good care of Hailey and myself. Your love for these dogs and their families is the best. Attached is a picture of Hailey brand new and ready to work.